I was cooking fried eggs today. 3.5 minutes on medium heat for both sides, the eggs were solid and yolk had been broken in with the whites, everything appeared solid outside. We noticed while eating that the majority of the egg was grandular like a hard-boiled egg, there was a pocket of yolk that was solid but more creamy and shiny. I cook for my elderly mil with cancer and try to be very careful about food safety. She shouldn't have undercooked eggs. 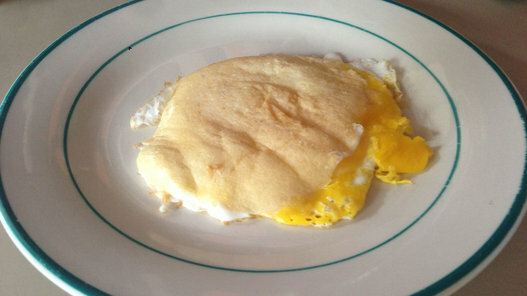 Was this egg concerned undercooked? I have been looking at different cooking styles of eggs and believe the section looks like the right very yellow side of the attached egg picture. The paperwork the doctor gave us says we should be concerned with listeria and salmonella. Any advice is appreciated. I'd personally consider that egg overcooked and give to the dog! I ensure my eggs have as liquidy a yolk as possible, with only the whites solid - known as "over easy". Many restaurants and cooking shows cook them over-easy, so I'm sure you're safe. Likewise seven minutes cooking an egg sounds absurdly on the high end. I cook mine for about a minute on each side (but only put it in the pan after the pan has already heated up medium hot). What you described doesn't sound anywhere near undercooked. Don't take that as medical advise, though!